A couple of weeks ago I was doing some work on my Decaris stamp database when I came across a set of thirteen stamps issued in 1948 that he worked on for Saarland that I didn't have listed. I immediately went searching for a copy of these stamps. When it comes to engraved stamps I usually opt for mint stamps, purely so the whole image can be seen without being covered in any way by a postmark. I quickly found that I was going to have to compromise when it came to these stamps. Mint copes are rather expensive, so I expanded my search to used stamps. After a bit of looking I found a decent used set for a reasonable price. The region of Saarland did not exist until 1920, and at that time it was called The Territory of the Saar Basin. It was created as a result of a regulation of the Treaty of Versailles after World War I. The territory was governed by the United Kingdom and France from 1920 to 1935. The territory was located in the southwest of Germany. It included parts of Prussia and parts of Bavaria (see the map below). Its capital was Saarbrucken. In 1935 a referendum was held and the inhabitants of the territory voted to rejoin Germany. In 1947 after WWII the Saar territory was once again taken from German control, and this time placed under the sole control of France. It was called the Saar Protectorate. 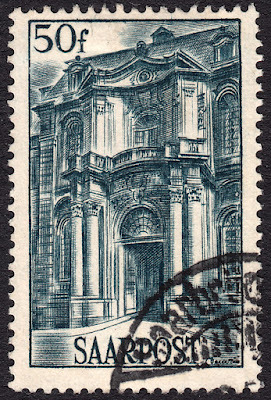 The Saar Protectorate remained under French control until 1 January 1957 when it was incorporated into the Federal Republic of Germany. During the two periods mentioned above the Saar territory had its own currency, the Saar franc, and its own postage stamps. 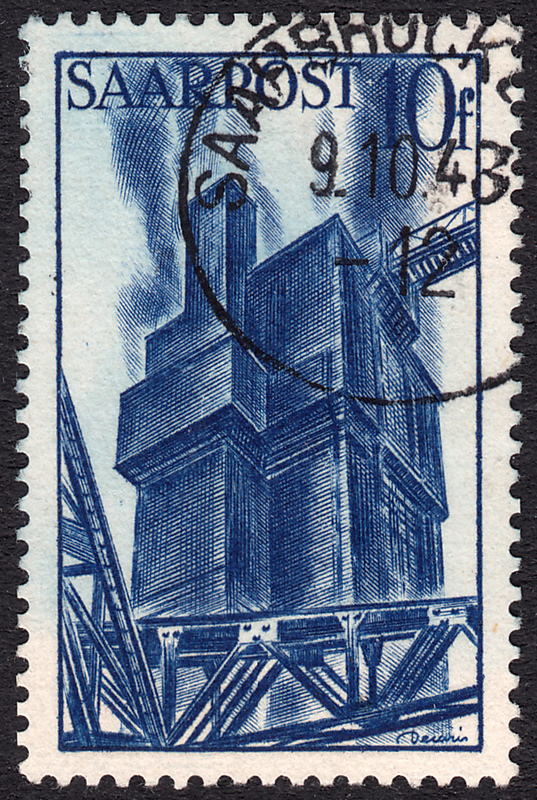 This stamp depicts a colliery shaft head. A colliery is a coal mine and all the buildings associated with running the mine. The shaft head is the business end of a coal mining shaft. It contains the relevant mechanics to extract coal from the mine. 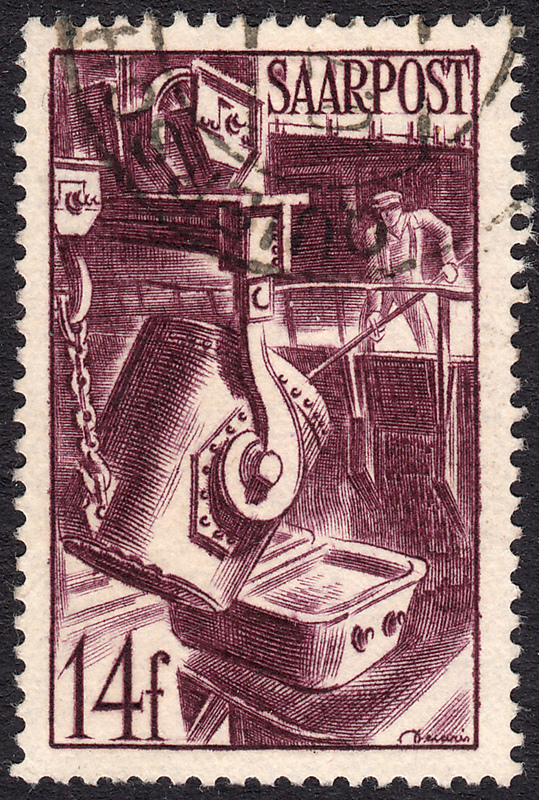 This stamp depicts smelting. Smelting is a practise whereby a base metal, such as silver, iron, copper etc., is extracted from its ore by heat and a reducing agent. The reducing agent is usually a type of carbon such as coke or charcoal, which in the heating process removes the oxygen from the ore leaving behind the elemental metal. Of course, this is just a basic summary. The actual process is just a tad more scientific, which is rather beyond the needs of this humble blog. 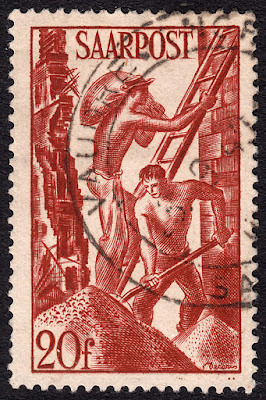 This stamp depicts reconstruction. 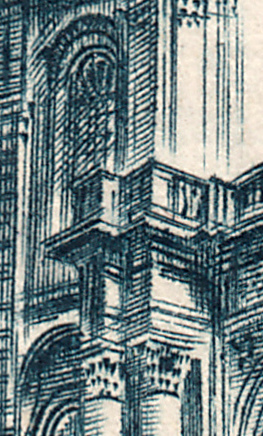 Presumably the reconstruction Decaris has illustrated is of buildings damaged or destroyed during World War II. 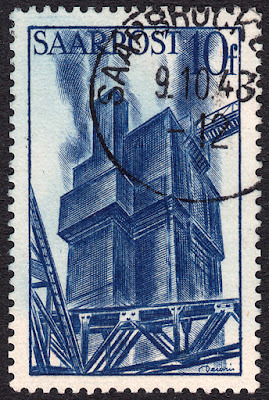 If anyone out there has any further info on this stamp and what it depicts, I'd love to hear from you.